The Weaver method (also called 3rd method) of Single Sideband reception is a little-used technique in HF receivers (except perhaps in Software Defined Radios architectures). This article is an introduction, some practical experiments with a 10m Weaver method receiver, and a collection of information on the subject. This question has plagued me for some time. Almost nothing is written on the internet about Weaver-method receivers. 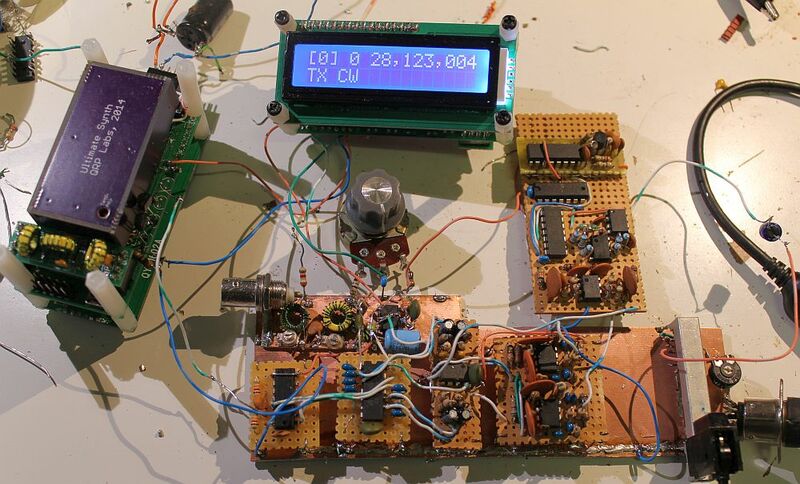 So I decided to investigate, and build an experimental receiver for the 10m band (28MHz). First, what is the Weaver method? Mostly you are probably familiar with the superhet architecture for Single Sideband (SSB) receivers. You may also be familiar with Direct Conversion receivers and the phasing methods for unwanted sideband cancellation. They require a 90-degree phase shift at Radio Frequency (RF) i.e. the signal or the Local Oscillator (LO), and at Audio Frequency (AF). These receivers have some advantages over superhets but they require an accurate 90-degree audio phase shift over a wide band (usually at least 300Hz to 3,000Hz), and this is difficult to obtain. Digital Signal Processing (DSP) techniques can however, produce very accurate 90-degree audio shifts and so this method is used in Software Defined Radio such as the famous Flex series and numerous homebrew designs. Phasing direct conversion is still an excellent and viable method for standalone receivers too. Particularly for a reproducible, easy to build multi-band HF receiver I think it solves many problems that can arise with superhet receivers. In a direct conversion based architecture you have no images, no birdies, no unwanted mixing products. At the front end of the receiver you mix down to baseband (audio) and from there on all is audio. Multi-band is much easier and it doens't require complex alignment procedures or shielding etc. Direct conversion receivers do have their own set of challenges, nothing is for free. Anyway what about Weaver? Weaver is sometimes (maybe often) called the "3rd method" (presumably the first being superhet, second direct conversion phasing method, third Weaver). In a Weaver receiver, no accurate audio phase shift network is required. Instead, there are a pair of low pass filters (LPF) in two (90-degree phased) audio signal paths. There is an audio subcarrier that we place somewhere in the middle of the audio passband, such as 1.5kHz. An extra set of mixers magically does all the phasing. The audio LPF's need to be closely matched but in general this is much easier to do than building a precise 90-degree audio phase shift in one path. What you end up with is NO unwanted sideband at all. Or more accurately, the unwanted sideband in the traditional sense is determined by the steep roll-off of the audio LPF. There is a narrow gap around the 1.5kHz sub-carrier where we cannot hear any audio. Apparently the human voice doesn't do much around 1.5kHz anyway so the loss of this gap doesn't matter. The "unwanted sideband" that is caused by any mismatches anywhere is actually WITHIN our audio passband. It is kind of folded back, mirrored around the 1.5kHz subcarrier. So if we are listening to a wanted carrier signal at 1.0kHz, and there is also an interfering signal 1kHz higher up (equal distance the other side of the 1.5kHz subcarrier), then we will also hear the unwanted signal at some attenuation, depending on how perfectly matched everything is. In the SSB modulation mde, you do not hear anything from any adjacent channel. The attenuated reflection within the same channel should not be noticeable. So, it's a promising technique that doesn't require an accurate 90-degree audio phase shift, and we can't talk about unwanted sideband interference from adjacent SSB channels because it simply does NOT exist. On the other hand, the circuit complexity could be said to be higher, because now we have a total of four mixers instead of two. Mathematically all this can be proved with sine and cosine identities and such, but come on, you are joking, that hurts my head far to much. Please read the info in the library for more detailed descriptions. You can also download there Weaver's original patent. Weaver was doing all this with valves (tubes) in 1960! Now with more modern devices it is much easier. I should mention that all these three receiver architectures can be used in a transmitter too. The interesting thing is that you will struggle to find very much mention of Weaver in the Amateur Radio literature or online! So this page is my attempt to experiment with Weaver, document my findings, and collect information in one place. This article is a practical 10m Weaver receiver, which works and has taught me a lot. I built it for 10m. Why? Because if you go for the highest HF frequency and can make that work, then most probably you can make it work at lower frequencies too! A collection of articles and links to practical Weaver projects online.